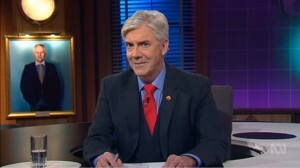 Mad as Hell returns on Wednesday June 21 at 8.30pm – Shaun Micallef Online! I’ve just watched your TV show today (6/7/17). It was very enjoyable except for the pay out on Father Brown. I’m a 32 year old young professional woman and considers myself very stylish and savvy BUT I do love old biddy BBC and itv dramas while eating scones with tea and so I absolutely adore Father Brown. It would be great if you could take back the offence to this lovely show. But I do agree, the names are very funny!